We are a motorcycle dealer in Mansfield Texas and we trade for just about anything. We just received this sharp 1982 Jeep CJ5. It has been repainted better than the factory paint, they smoothed out all the factory spot weld marks. The hood has stainless steel hinges and the cowl vent is also stainless. The grille is a chrome insert up front. The suspension is a rancho 2” lift with longer shackles to level the jeep and allow for the Wrangler 33” MTR tires mounted on aluminum 15” wheels. It has a front sway bar with quick disconnects for off-road use. The motor is the stock 258 CI inline 6 with a Clifford valve cover and a six into two header exhaust, the converter is still on the jeep and the cat back part of the exhaust look new. It has an oversize fuel tank, I don’t know the fuel capacity. The transmission is a four speed and the transfer case is a dana 300. It shows 145k miles, runs good, 4wd works as it should. It does leak oil around the valve cover, these are tough motors, some day it will need to be re built and re sealed. The dash is in excellent, no cracks, the seats are updated best top seats, the rear looks factory. It has a new carpet kit that looks nice. It has a front roll cage with grab handles. I drove the jeep and the motor runs smooth, the transmission shifts smooth, the power steering is a big plus with 33” tires. The body is very soild and free from rust, it has a few scratches from some light offroad use in Moab. I could not get the JVC stereo to come on, should be something easy. 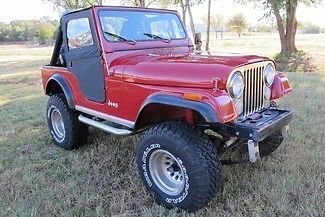 Overall it is a very nice jeep considering its age and what it was designed to do. Look at all the pictures and watch the video. Give us a call if you have any questions. We look forward to working with you. We offer the absolute best extended warranty coverage in the business. Our products are not backed by some substandard company, but are supported by a name that has been trusted since 1872. We only offer our customers products they can trust. You can rest assured that in the event of a claim, Zurich will be there to stand behind you.Vehicle Service ContractsA service contract provides coverage for parts and labor costs associated with repairing your motorcycle. The cost of your service contract can be purchased separately from your motorcycle or included in your monthly payment. A vehicle service contract will help eliminate unexpected major repair costs. Our contracts are available with optional pick-up and delivery, trip interruption, and substitute vehicle coverage. With Zurich at your side, your break down won’t break your budget!Tire and Wheel CoverageThe road hazard tire and wheel program provide coverage for the only part of your motorcycle that touches the road. As you drive down the road each day, you face hazards that can cause damage to your tires or wheels. Help protect your wallet from unexpected repair costs and towing charges. Ask about our tire and wheel coverage today.Gap InsuranceGuaranteed Asset Protection can be a life saver. If your vehicle is stolen or damaged beyond repair, your insurance alone may not pay everything you owe. Vehicle insurance typically pays the vehicle’s actual cash value rather than the amount remaining on your loan, which could leave a financial “gap” of thousands of dollars. Get GAP insurance and get peace of mind. We have rates as low as 3.99% and terms of up to 84 months. We offer flexible repayment options and specialized financing for all credit types. Texas Best Used Motorcycles will customize your financing based on your needs. You can stop by the store to fill out a quick credit application or submit an application online. In addition to financing we offer liability insurance, gap insurance, and extended warranties. Our financing experience gets you ready to hit the open road. Just sign and ride! We are also now offering our TestRide® program. With terms of 24-48 months, we can get you up and riding for a lower monthly payment than you ever thought possible. All credit types are accepted. Fill out an online application now. While we make every effort to accurately describe our vehicles, please understand you are purchasing a used motorcycle. They come with no warranty express or implied from our dealership. However, the bike you purchase may have factory warranty remaining. Texas Best Used Motorcycles also offers extended warranties for your piece of mind. We encourage all buyers to look at the bike in person or order an inspection by a third party prior to the auction ending. Please review the numerous high resolution pictures carefully, as well as watch the Youtube video of the motorcycle located at the top of the auction. We take great pride in our customer's satisfaction and make every effort to point out any flaws in the motorcycles we sell. If you have any questions, please call us at 817-985-8888 and we will answer them. All buyers will be charged a $125 documentary fee. This helps us with costs associated with title and bank paperwork and while it is a far cry from absorbing all the costs, it helps us keep the costs of our motorcycles low. Buyers will also be subject to a $195 dealer preparation fee. This fee goes to absorb the costs of oil changes, state inspections, professional details and other make ready work. The last fee is a state required vehicle inventory tax. It is charged at a rate of .2409% of the selling price, which equates to $24.09 for every $10,000 of purchase price. Buyers will also be responsible for all state and local taxes and fees. Auction PoliciesA $500 non-refundable partial payment is due immediately. Buyer must contact our office within 24 hours of auction close. The balance must be received within 7 business days via wire transfer, cash, or check. All checks are subject to 10 day hold. All bidders with 0 or negative feedback must contact us prior to bidding. Otherwise, your bid may be canceled. If these terms are not adhered to, we reserve the right to relist or otherwise sell the vehicle.Buyer PickupA representative from our dealership can be available for pickup at area airports when necessary. Buyers must schedule pickup prior to making travel arrangements. Texas Best has close relationships with its shippers. We can get your bike to you in a safe, timely, and cost effective manner. Air, sea, and truck frieght are all at our disposal. Give us a call to discuss your shipping needs and your budget. We are eager to get you up and riding! Who is Texas Best Used Motorcycles?Texas Best Used Motorcycles is the latest offering of the No Limits Powersports family of dealerships. No Limits has been associated with the retail motorcycle business since 1996. We started out in a 6,000 sq. ft. facility across from the Cowboys Stadium in Arlington, Texas. We built our business on quality relationships with quality people. With the dawn of the internet, our business exploded! In 2003 we bought a new building in the southeast corner of Six Flags Mall, just minutes from Texas Ranger’s Ballpark. Our state of the art, 27,000 sq. ft. facility provided room for our growing business. After nine years at Six Flags Mall, we have yet again outgrown our facility. Accordingly, we decided to open Texas Best Used Motorcycles as an additional outlet for our growing customer base. What makes Texas Best Used Motorcycles different from other motorcycle dealers?We distinguish ourselves from other dealers in variety of ways. The single most important reason is the quality of our motorcycles. Over the past 17 years, we have bought and sold approximately 20,000 motorcycles. Such significant experience teaches you what to look for in a quality motorcycle. We primarily obtain our motorcycles from car dealers who take the motorcycles as trade ins. Our dealer principal spent almost 30 years in the automotive industry and has forged strong relationships with dealers nationwide. We also actively purchase motorcycles from individuals just like you!Another important distinction is our business model. After combing through countless customer surveys, we have built a store around what you want! When you come in to Texas Best you will find value priced bikes, a relaxed atmosphere, and an exceedingly simple sales process. In addition, all of the prices are right there on the motorcycle. No need to ask some high pressure salesman for a price. The best part about our business model is we sell all types of motorcycles and we have the best selection of bikes under $10,000. That's right! We have a great inventory mix as well as a large selection of bikes for $10,000 or less. Come by our showroom today and let us show you why we are different from any motorcycle dealer you have ever experienced. Please understand we are a traditional brick and mortar store. Therefore, all of our motorcycles are for sale on our showroom floor. We sell lots of motorcycles and consequently are able to offer you very competitive prices. That being said we can sell as many as 15 motorcycles in one day! Every month we have at least one customer who hits the 'buy it now' while another walk in customer is signing the paperwork on that same bike. PLEASE CALL OUR STORE TO CONFIRM AVAILABILITY. If you want a bike. Hit the buy it now and immediately contact our store. You can then be confident that you are the proud new owner of one of our units! Just a reminder, we are closed on Sundays and Mondays. Thank you for viewing our listing.